Well you can add another to the list! Tonight we discovered our Ancistrus sp. “Honeycomb” spawned. This species has one of the most interesting patterns of any Ancistrus. It has gained a lot of attention recently among catfish enthusiasts and rightfully so. Just take a look! Hopefully we will be able to offer this species sometime next year. Stay tuned! We have some great news! The spawning keeps on going in the fishroom. Just in the last two weeks we have had spawns from our Centromochlus schultzi, Tatia gyrina, Scleromystax sp. “CW147” and another batch of our Hypancistrus zebra. 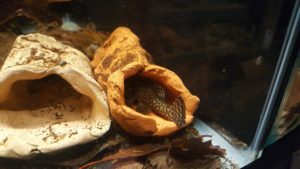 Recently, we have had several inquires about our Ancistrus sp. “Snowflake”, well we are happy to report they have finally spawned again! The male is actively guarding the spawn perhaps better than ever. Unfortunately, the male has previously either kicked out the eggs or very few have survived. This particular batch of eggs looks promising. One positive is that the male is a year older now and more experienced. It appears that there are roughly 25-30 eggs but of course they are hard to count. The male only offering brief views and honestly, we do not want to disturb them. Interestingly, the eggs were fixed to the roof of the cave. All of our Hypancistrus lay eggs that only adhere to each other and the male freely moves the egg cluster around. Below you will see a video sharing some of our fish along with an update on the All-American Catfish Convention, CatCon. 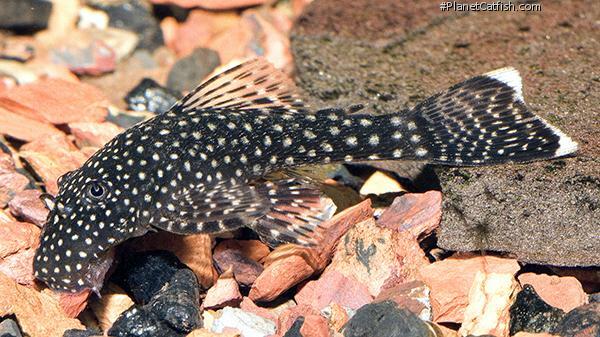 We are proud to announce that we are donating 4 Hypancistrus zebra, Zebra Plecos to CatCon. All of the funds will go towards helping pay for the great speakers that they are bringing in for the event. We will also have this species and others available for the Spree on Three. Visit http://www.catfishcon.com/ for all of the details including Spree on Three: http://www.catfishcon.com/Program/Activities/Spree-on-Three. A special thanks to SwissTropicals.com and PlanetCatfish.com for the photos of Ancistrus sp. “Snowflake”.